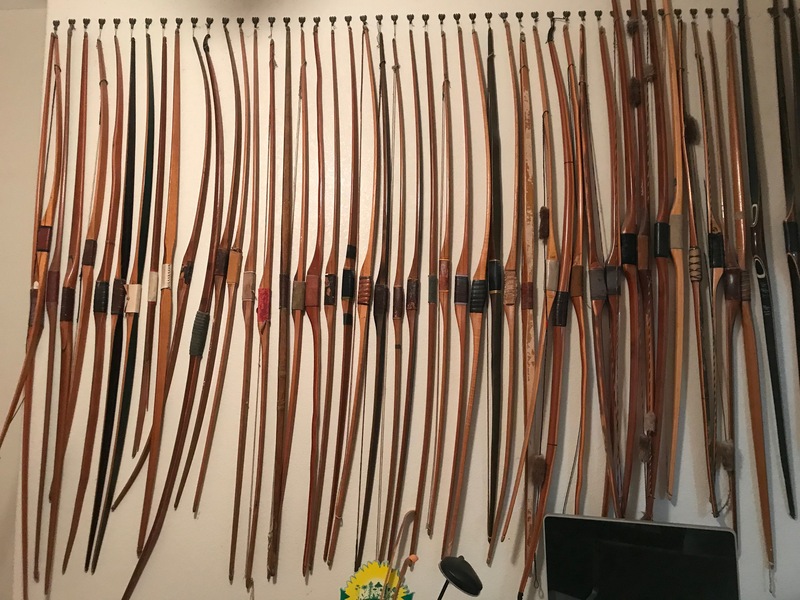 Can anyone help identify some of these long bows? These were part of my late father's archery collection. I am working on cataloging and labeling everything for my family. I need help with the first 30 or so bows, starting from the left. I know what everything is from the first bow with a Fur String Silencer on to the right. Any help would be appreciated. I'll try to get more detailed pictures of the individual bows soon. Third bow from left looks like Kibbe,Cant see the first bow the 3rd looks like Kids Indian..4th bow Indian or American archery..probabilly American archery..9th bow looks like Kibbe..a couple of bows from rt. to left look like maybe barns bows..It is so hard to tell with out seeing them ....4rt bow on the right to left see if there is a name on it....anywhere..